The Rescue Team had an eventful day in our own backyard. I received a call on our hotline from the Quincy Police Department that there was a stranded porpoise in Quincy. Once it was determined that the porpoise was alive, I told them we were on the way. Unlike seals which are semi-aquatic and often rest on the beach, a dolphin on land is in immediate need of assistance. When we get a call for a live dolphin, we automatically pack our gear and head out to the scene. If it is a far distance, we'll have one of our field volunteers go out to provide supportive care to the animal while we are in route. 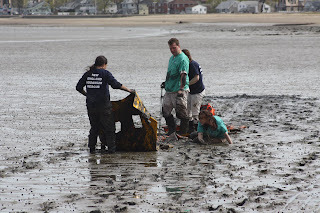 This case happened to be in Quincy, near our Animal Care Center, so we were there in no time. As we were driving to the scene we spotted the animal from the road. Immediately we noticed it was not a porpoise, but a juvenile Atlantic white-sided dolphin. This changed our approach for many reasons. First of all, white-sided dolphins are larger than porpoises, so usually involves a larger team. They are also a social species, so an animal that strands alone is not a rehab or release candidate because they cannot survive without its social group. We also noticed seagulls already pecking at the animal. 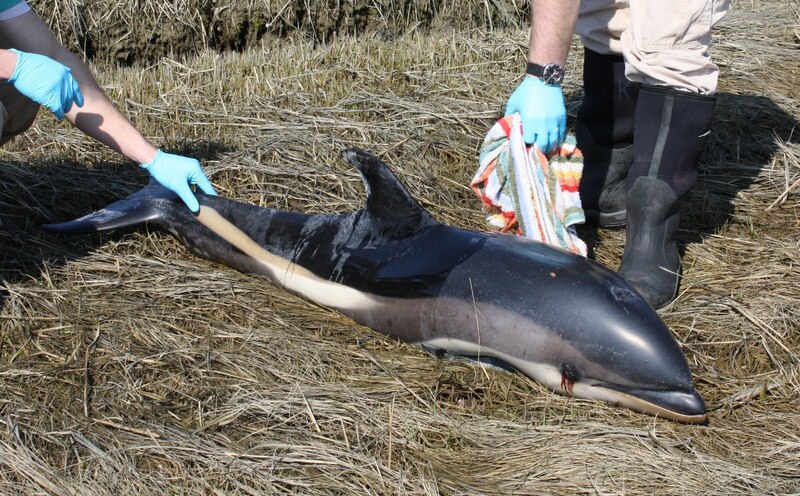 The above photo is an Atlantic white-sided dolphin that stranded in Duxbury last week. 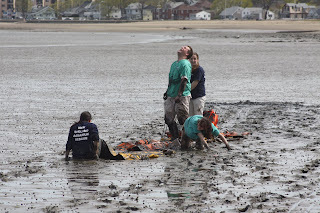 We also faced another challenge with this rescue: mud, and lots of it [similar to this March 2010 rescue effort]. 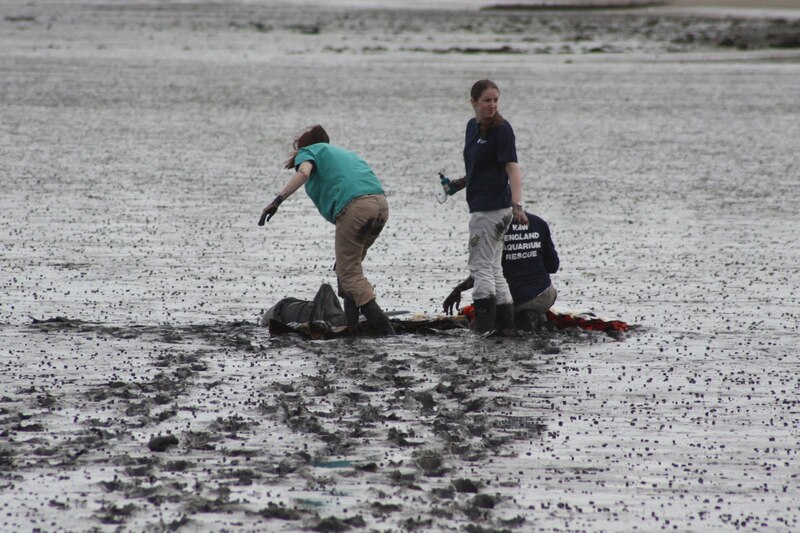 The dolphin was stranded on a mud flat making it quite a journey to get out to the animal. After getting stuck a few times, we made it out to the dolphin. We were able to get the seagulls away, but they had already done damage to the blowhole. The animal was in a great deal of stress from the stranding event. We did our initial exam and collected blood to be analyzed. Above: We made it out to the dolphin and prepared to draw blood on the animal. I had called Adam to bring us some more stretchers and a sled to pull the animal across the mud in. Adam was a trooper and came to our rescue. Based on the results of our exam, blood work, and the fact that the social needs of this animal could not be met, we elected to humanely euthanize this animal. Although euthanasia is always a difficult decision, it was in the best interest of this animal. 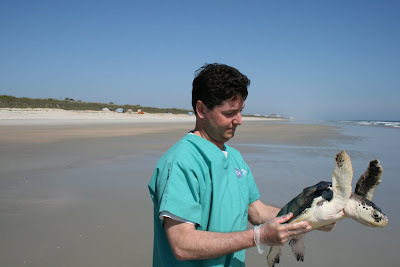 The rescue team performed a necropsy on the animal the next day in order to determine the cause of the stranding. There was nothing obvious to determine the cause on gross exam, and pathology is pending. 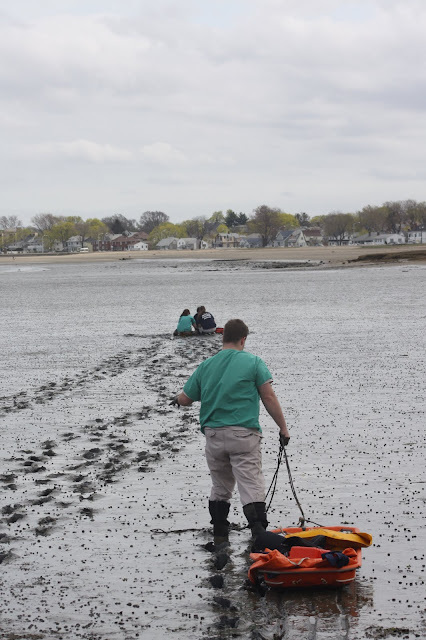 Even though the cause of stranding remains unclear, the damage from the gulls during the stranding event and the fact that it stranded alone were the reasons euthanasia was the best option in this case. Our way back to dry land with the dolphin carcass was adventurous. Our necropsy coordinater Katie and intern Kelly were laying out stretchers for Adam and I to walk over while pulling this 100+ pound carcass across the mud. We had to make the most of a difficult situation, and watching Katie fall in the mud definitely helped. 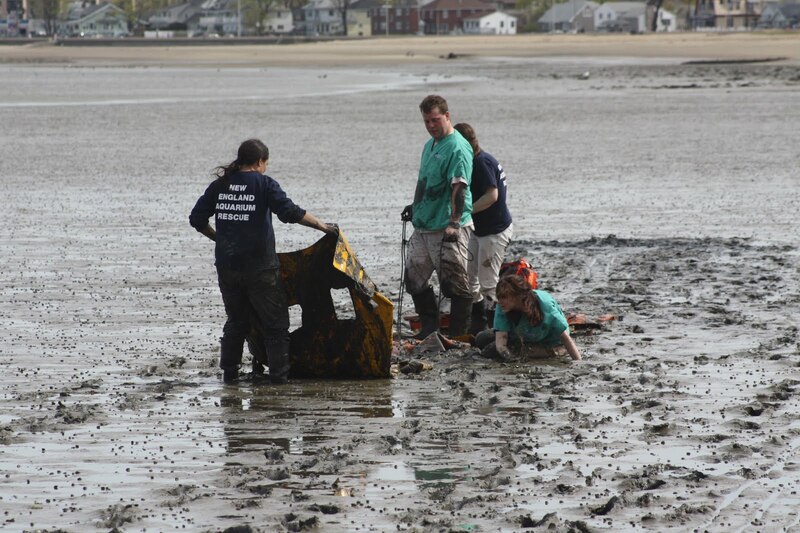 You can read more on what to do when you find a stranded marine animal on the beach here. A special thanks to the Quincy Police Department for reporting this animal so quickly! After the release Dr. Innis and I decided to get some rest. But, we had heard that there was some nesting of leatherbacks on beaches further south. We definately wanted to check that out. Charlie found out a colleague, Dr. Mette was not at the International Sea Turtle Symposium so he gave her a call and indeed they have had nesting leatherbacks and she invited us down to catch up and possibly see a nesting turtle. Dr. Mette is the veterinarian for both The Loggerhead Marine Life Center and The Gumbo Limbo Nature Preserve. Many of you may remember her and those facilities form our posts after the giant Florida cold-stun event in January of 2010. For those newer to the blog check out the information here. Dr. Mette has a pretty intense case load of turtles right now. Two of her patients you can see in the photos above. To the left is a green turtle with a prop strike and to the right is a palm sized hawksbill. Both turtles are undergoing therapy at the Marine Life Center. Yes I did want to pocket the hawksbill and bring it back to the New England Aquarium. After hearing some amazing stories of the turtles at the Marine Life Center we went and had dinner and waited for the call from the beach team. We had finished dinner and catching up and still no call. So Dr. Innis and myself decided to start walking the beach. We got to the half way mark and no turtles. So we started back. We got the call at abuot 11:30 p.m. saying they had a nesting turtle and that Chris would come and pick us up. Of course the turtle was on the other side of the beach about 8 miles away. So Charlie and I found the nearest beach exit and started towards them. Chris picked us up in the van and off we went. Above is Stella. Some of the pictures are blurry because we do not use a flash while the turtle is nesting. Although, they do enter a sort of trance like state they nesting turtles can be disturbed so if you are lucky enough to see a nesting turtle and have a camera make sure your flash is off. They knew which turtle she was because of the tags on her rear flippers and the PIT tag in her front flipper. Stella also had a hook stuck in her right shoulder. That little blurry object in the middle of her shoulder was a fishing lure. After she had completed her nesting and was starting to cover her eggs. Dr. Innis got to work on getting the hook out. Chris had a dehooking kit with him and using that we were able to easily get the hook out. 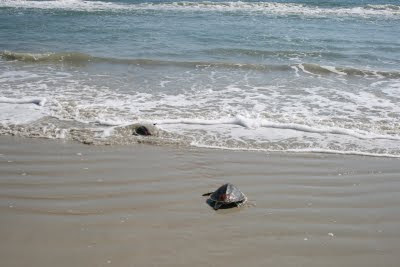 After quite a while of covering her nest stella unceremoniously headed back to the ocean. Above is Stella's tracks leading to the ocean. A special heartfelt thanks to the beach team for putting up with us and getting us to a turtle. Words can not describe how awesome that was! Now back to the hotel (it was about 1:30 a.m.) a little sleep and home to Quincy. This is Dipper. This turtle was brought to us from the Mystic Aquarium during the cold-stun when Skip and Janelle were helping out (see the post here). Now this little one is off the coast of Florida terrorizing crabs I'm sure! Read more about the transport to Florida in this post and this post. Here are some more photos from the journey. During the trip down we had to stop and lube up the turtles to make sure they didn't get dry. Dr. Charles Innis did a great job rearranging the totes. Above right is one of the NAIB turtles. with some refreshing 72F Atlantic water. The first group of turtles were the Wood's Hole turtles. "Carina" "Adrastea" and "Ursa." You can see before and after photos of their treatment in this post. They were not too excited to go in the water at first so they had to be moved a little closer and were joined by one of the University of New England (UNE) turtles. That turtle was ST-10-144 we did not name the turtle as it went to UNE fairly quickly after intake. Asheley from UNE told me the name was North Star. Now for the other two UNE turtles. Dr. Innis and Dr. Candace Carter from the National Park Service get to do the honors. MARC-10-110 on the Left is "Pollux" and MARC-10-111 is "Apollo"
Now for the 2010 New England Aquarium turtles. I am not 100 percent sure which photos have which turtles so the list is: Equinox, Desdemona, Cordelia, Cressida, Portia, Borealis, Aurora, Betelgeuse, Kepler, Thebe, Metis, Carpo, Titan, and last but not least my little window buddy Tres-4! There they go! Can you still see the turtle? Now for Amistad! This turtle came in with the 2009 cold-stun! Due to a lameness issue the sea turtle was unable to be released. Good Luck Amistad. We will miss you! They're all gone. Not to worry Charlie we still have 25 turtles back in Quincy. 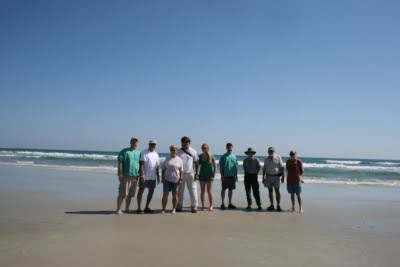 Photo of the group left to right Krystan Wilkinson a superstar 2009 Summer intern. 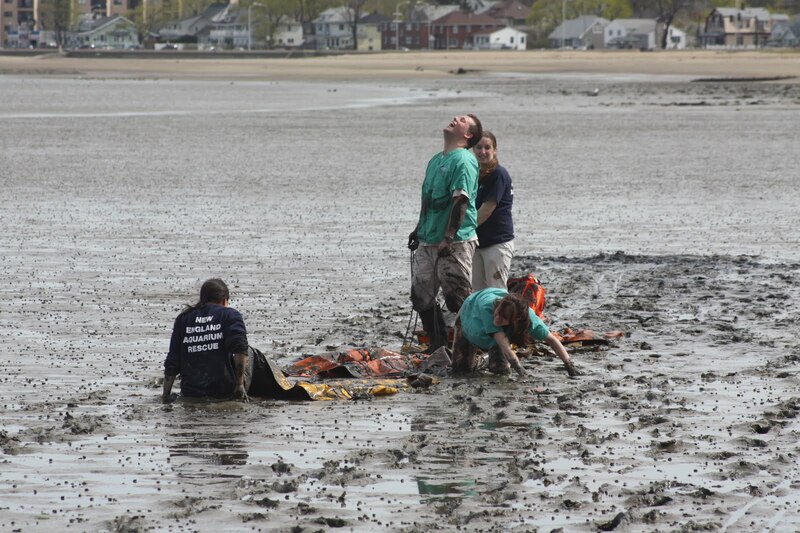 Dr. Candace Carter (NPS), a gentlemen from Fall River walking the beach who helped with the release, Patty Geuder, Dr. Charlie Innis, Neal Folsom, Kip Hulverston, and Richard Tucker. Besides the gentleman from Fall River (if you see this blog please comment) the only other non official personnel to wish the turtles good luck were this group of birds. It was a beautiful day. We have been very busy as of late with harp seals, grey seal weaners, and our turtles. 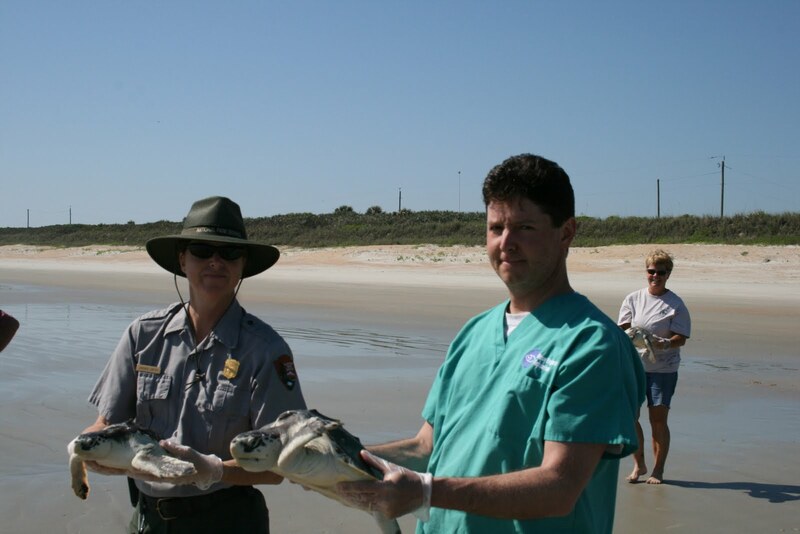 On Tuesday Dr. Innis and I headed south to bring 24 Kemp's ridley sea turtle's to the Canaveral National Seashore in New Smyrna Beach Florida. 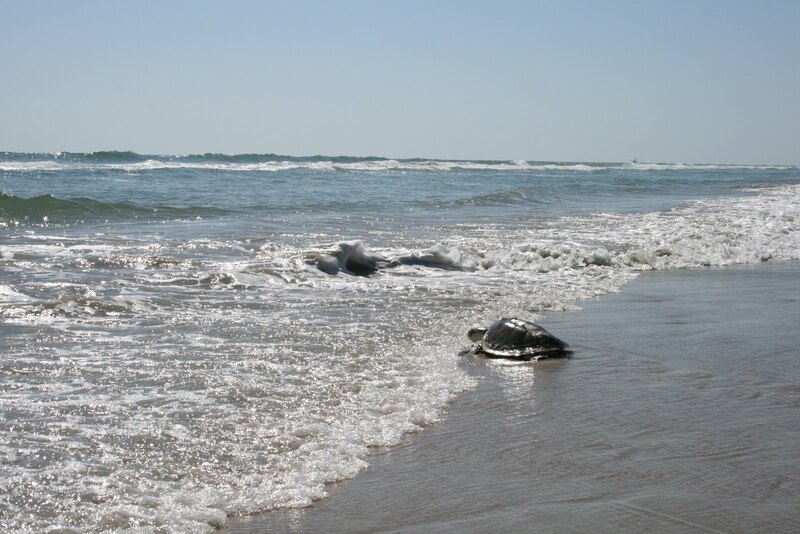 Releasing these rescued sea turtles here seems particularly fitting, since they were all named after astronomical terms and the final space shuttle launches are taking place this year at the Kennedy Space Center. 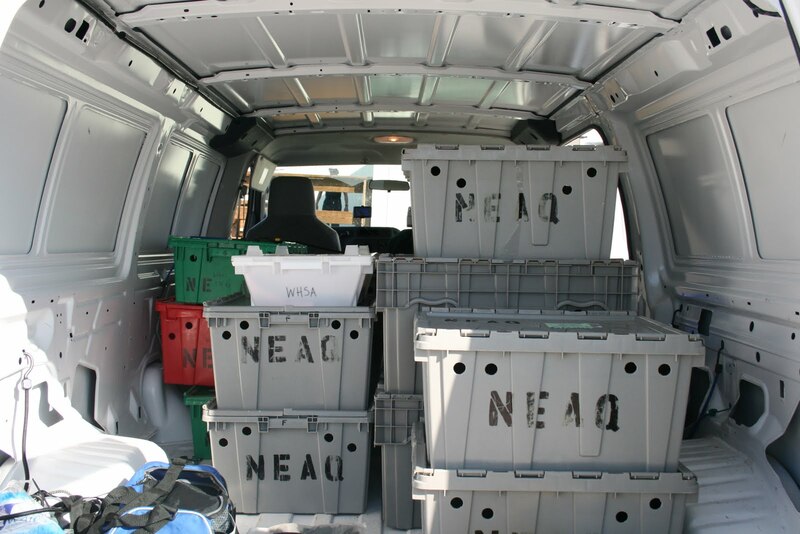 Of these turtles 16 were directly transferred from the New England Aquarium, 3 were from University of New England, 3 from Wood’s Hole Aquarium and 2 were picked up from the National Aquarium in Baltimore. The day started early with a media event. I arrived at 6:30 a.m. to meet the Aquarium’s public relations guru, Tony, and New England Cable News to talk about the turtles and the release. After a couple of hours of pretransport treatments we were on our way. After about 5 minutes of good times we hit traffic on 93 north. The turtles, Charlie, and I were none to happy. After forty minutes we were all now happily heading west on I-90. Our first stop was in Baltimore were we met Jen Dittmar from the National Aquarium Stranding Department. She gave us two of the turtles they have been caring for since this past cold-stun season [You can read her blog posts here]. After securing the turtles we headed south to Richmond to drop off our loggerhead with a couple great volunteers, Kathleen and TR, from the Virginia Aquarium and Marine Science Center. 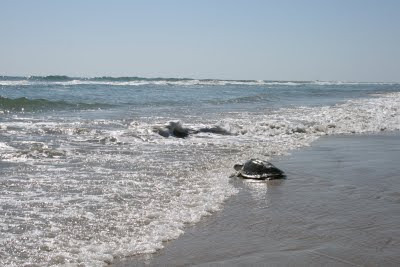 There the turtle will continue its rehab and hopefully get a satellite tag prior to release. 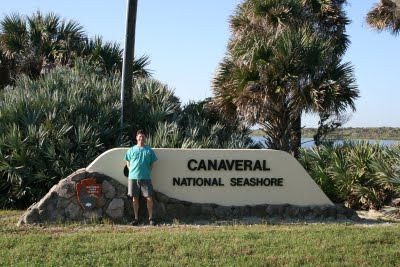 Then for the long haul... another 12 hours to New Smyrna Beach and the Canaveral National Seashore. It was worth it though. 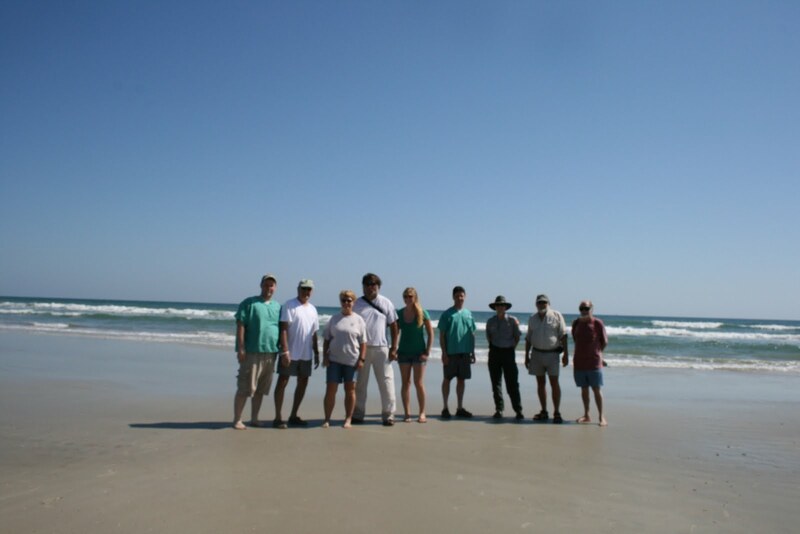 The team poses for a photo after the release. Check last year's release post here. 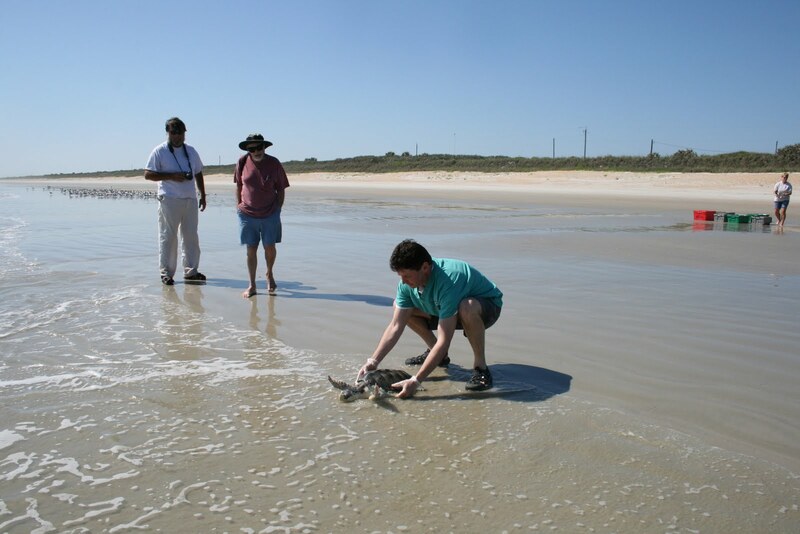 Sea Turtles travel to Florida for release!